Don't miss all the action this Saturday, May 7th, as pound-for-pound and WBO welterweight champion Manny Pacquiao defends his title against three-division world champion "Sugar" Shane Mosley at the MGM Grand in Las Vegas, Nevada and televised live on Showtime Pay-Per-View. What's at stake? How will the fight play out? Check out the FightHype Breakdown to see why you don't want to miss this fight! The first Saturday of May is here, and with it we get a gambler's paradise. Earlier in the day will be the one hundred and thirty-seventh running of the Kentucky Derby, and at night, as has become customary on the first Saturday of every May, we will also get the biggest boxing event of the year. Chances are good that it could be topped should Floyd Mayweather return against Victor Ortiz or Miguel Cotto in Dallas, which we have heard some recent buzz about, but for now, this is the event of the year, and until Manny or Floyd schedule their next fight, it will stay that way. If Pacquiao does what the odds makers expect him to do, it sounds like a third installment of the Marquez battle is what fans can expect. Recently, Golden Boy has attempted to put the kibosh on that fight by offering Juan Manuel a matchup against Saul Alvarez, but I am hard pressed to imagine Canelo squeezing down to 147 pounds. But let's suppose that the Marquez fight next is not a given; so if not Marquez, then who else makes sense? Well, I think we all have come to terms with the fact that egos on both sides are going to make the Mayweather fight damn near impossible to make. Sergio Martinez even at a catchweight is not going to happen. Could a rematch with Cotto be sold? Maybe Chavez Junior? 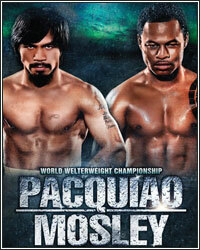 I think a better bet would probably be Timothy Bradley moving up to fight Pacquaio at welterweight. It is sellable, as well as makeable, and would represent a scalp Pacquiao has yet to claim. On the flipside, what if the big upset was to happen? I am not sure that means a definite rematch. In my view, there is a very good chance we would see the MayweatherMosley rematch first, which in turn would probably make the third Marquez fight that much more important to Team Pacquiao. For Shane Mosley, a win would basically erase every down moment in his career and put him in a position that he has not enjoyed in a very long time. You can expect that Floyd Mayweather would jump all over the opportunity for a lucrative rematch and a chance to let Pacquiao know that he did it twice, while Pacman couldn't do it once. But if Mosley really wanted to maximize his value coming off what would likely be the biggest win of his career, he could try to let Pacquiao and Mayweather get in a bidding war for his services. In short, Sugar Shane would be in a terrific position. Conversely, a loss for Mosley might signal the end of an extremely successful future hall of fame career; it all depends on how soundly he gets beaten. If Shane Mosley is competitive in there and has his moments, a return to the ring would almost seem certain. Perhaps they could finally get the Andre Berto fight done since he will be looking for a big name opponent to return against and restore some of the luster. If not Berto, maybe Saul Alvarez or even Kermit Cintron. In the end though, it all comes down to what kind of loss this is for Mosley and how much desire he has to continue fighting. There really is nothing like the opening bell of a big fight. The tension, the drama, the buildup, the excitement...no sport can provide it like a big boxing match. Early on, look for Manny Pacquiao to be careful with Shane Mosley; at the same time, expect a slight changeup from Mosley as he attempts to counter Pacquiao and hopefully time him coming in. Pacman will shoot a jab behind a high guard from a crouched stance, waiting to see what comes back; maybe tempt Mosley to throw his overhand right as he shoots a left behind the jab, and then circle away as he works on getting comfortable with Mosley's pattern. Conversely, Sugar Shane will look to draw Manny in, flurry quickly and then hold before Pac can escape or let his hands go. The first couple rounds will prove to have some tense moments as fight fans wait to see what happens when Mosley lands a clean shot on Pacquiao, and he may, but if his goal is to put in the work to win, instead of simply capitalizing on the notion that he has a punchers chance, his best bet is to focus that attack on the body. No matter what the cost, Sugar Shane must find a way to get to Pacquiao's body early and with consistency throughout; but how? Well, this is the part that is up to Naazim Richardson. As we have seen in the recent past, attempting to walk Pacquiao down behind a jab only nets you a constant beating. Cotto had some success early, but soon enough, Pacman began letting his hands go and the Cotto jab, which is one of the better in the business, was useless. We have also seen that jumping him doesn't seem to work all that well either. Ricky Hatton looked like he might bother Pacquaio, but again, once Pacman started letting his hands go and showed his own foot speed, it was all over. Mosley's feet are not anywhere near as quick or adept as the Hitman's. Sitting back and trying to counter him is an option, but we all saw how badly Joshua Clottey was bottled up, unable to land much of anything until Pacquiao opted to stand on the inside simply trying to get The Grandmaster to let his hands go. So what will work? It seems that the only real way to get the Filipino superstar off his game is to constantly change it up in there, have the willingness to throw when Pac throws, and the ability to time an opponent as well as anyone in the sport. I think you can see where this is going. After a few tense moments early on, look for Pacquiao to take the fight over with his frenetic pace, fast legs, constant angles, sudden combinations and accurate shots. Shane Mosley is a tough guy and a proud warrior, he will fire his shots off when he gets a chance, but when Pac find his groove, Sugar is going to be three steps behind all night long. Down...up...down...up...and the straight left with no telegraph to finish, Mosley will wait on him and potentially return fire with a shot upstairs that is off the mark. Do it again, mixup the combos and keep Sugar Shane turning. Mosley will lunge in to hold, and Pacquiao's legs will get him out of the way until he decides to go to the ropes in an effort to test what Mosley really has to offer in there. Round three, round four and round five will all start to feel like one long round as Pacquiao works with high energy and Mosley becomes increasingly puzzled. The only thing left to determine is whether or not the former champ from Pomona can summon one last comeback and dig down to land that big shot that Pacquiao will most likely give him the opportunity to connect with. Shane Mosley is 39 now, and in fairness, he hasn't looked good in a very long time. He is always dangerous because of his hand speed and power, but in order to make something of that, you need to be in the position to land it. There was a time ten or eleven years ago when a welterweight Shane Mosley would have given Manny Pacquiao a very difficult fight. In fact, I am sure many would have picked him to win and they wouldn't get a strong argument from me. That Shane Mosley was a beast; he would be able to get in punching range behind a quick jab, rip shots downstairs and upstairs, and would happily throw when his opponent threw. That's not the guy we have anymore; it's been a long time since we had that guy. This Mosley paws with the jab, flinches when his opponent throws, holds on the inside and struggles to adapt. While he has never been a defensive fighter, nowadays, head movement isn't even something we see sporadically. Sugar Shane is a proud guy though, and he will undeniably walk into the ring as not only the bigger man, but also with the sense that he is the much stronger man. Odds are good that he won't recognize a speed deficit ahead of time either, but that will change soon enough. In short, I expect this one to remain competitive for a round and a half or so. Manny Pacquiao will assess what's in front of him, show Mosley a little bit of speed here and there, some tough angles, and once Sugar looks like he is comfortable and making it a bit of a fight, out will come the real combinations and movement. Expect to see a confused Mosley early on as each passing round starts to look like a carbon copy of the one before it. Soon enough, the only real question will not be whether or not Shane Mosley can land something important, but can Pacquiao be the first guy to stop him? From the 6th round on, expect to hear Naazim Richardson threatening to pull the plug on his fighter and stop it. This might provide his man with a slight burst, but that will be short lived. The official call is Pacquiao by TKO at the end of the 8th as Naazim Richardson stops the fight between rounds and shows his fighter the type of compassion someone should have shown Antonio Margarito last November. In the end, the most intriguing part of the night will be whether or not this fight sold as well or better then the MayweatherMosley fight. Enjoy! Questions...comments...agree...disagree? Send me an email at jdemaria@fighthype.com.